The purpose of this study is threefold. First, an estimate of state IQ is derived and its strengths and limitations are considered. To that end, an indicator of downward bias in estimating state IQ is provided. Two preliminary causal models are offered that predict state IQ. These models were found to be highly predictive of state IQ, yielding multiple R's of 0.83 and 0.89. 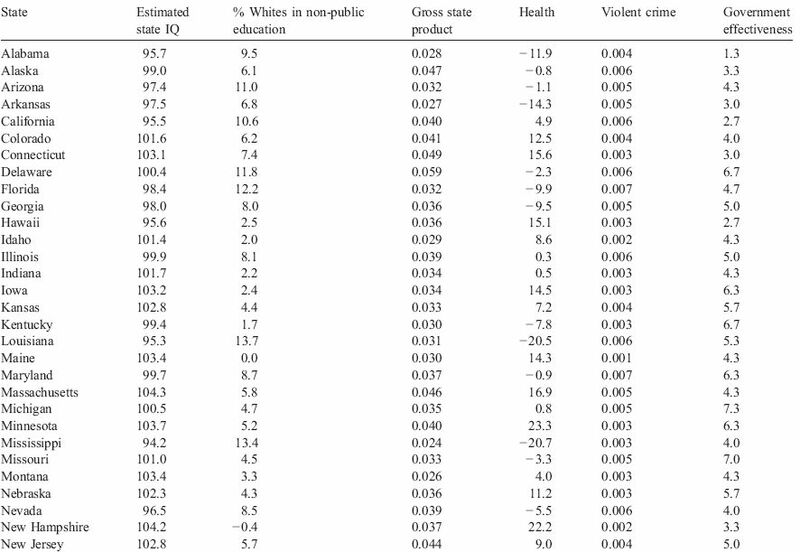 Second, the extent to which state IQ predicts state outcome variables (e.g., gross state product, health, violent crime, and government effectiveness) is estimated. 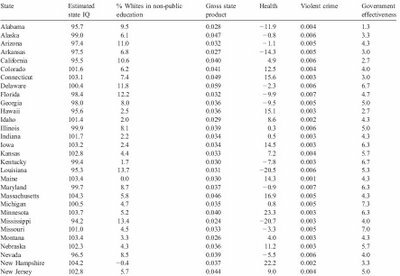 State IQ shows positive correlations with gross state product, health, and government effectiveness and negative correlations with violent crime. These results are consistent with the extent to which IQ predicts outcomes at the level of the individual. Third, a research agenda is provided for improving estimates of state IQ, identifying factors that cause differences in state IQ, and delineating the role of IQ in predicting important variables.